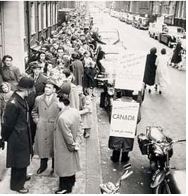 Crowds queue up outside the Canadian government Immigration office in London, England, during the 1956 immigration rush. Canadian immigration history lacks any details on Queer immigration before the 1980s, mostly due to fear of being refused entry or even deportation. Before the 1950s, officials including border guards were given the power to exclude people who were coming to Canada for any “immoral purpose” – homosexuality was included in this definition. The Immigration Act of 1952 was the first time the law directly referred to homosexuality as being grounds for being excluded entry into Canada. If the new immigrants were found to be gay or lesbians, they could be deported if they “practice[d], assiste[d] in the practice of or share[d] in the avails of … homosexualism.” (1952 Immigration Act section 19). This was in keeping with the criminal law and Canada’s response to cold war paranoia about the ‘other’ – be they homosexuals or communists. Times and attitudes changed and the Immigration Act was repealed in 1977 where gay/lesbians immigrants were allowed to enter the country. There are no known statistics of this time period on how or who was refused entry for being a ‘homosexual’. This lack of information has created a large hole in understanding what the Queer immigrants experience was in coming to Canada. If you are a member of the queer community and immigrated to Canada in the 1940s or 1950s, we’d love to hear your story. Please contact us! Calgaryqueerhistory.ca welcomes researcher Tereasa Maillie to our collective. Tereasa brings extensive experience in oral history practice as well as an enthusiasm for researching the queer immigrant experience. She wrote today’s post and articles on this website will be identified by the author’s initials going forward (KA). This entry was posted in Gay history and tagged gay, Gay history, history, human-rights, immigration, queer. Bookmark the permalink.